If you are former San Francisco 49ers quarterback Colin Kaepernick and current Carolina Panthers safety Eric Reid, that number is less than $10 million, according to a report from the Wall Street Journal. 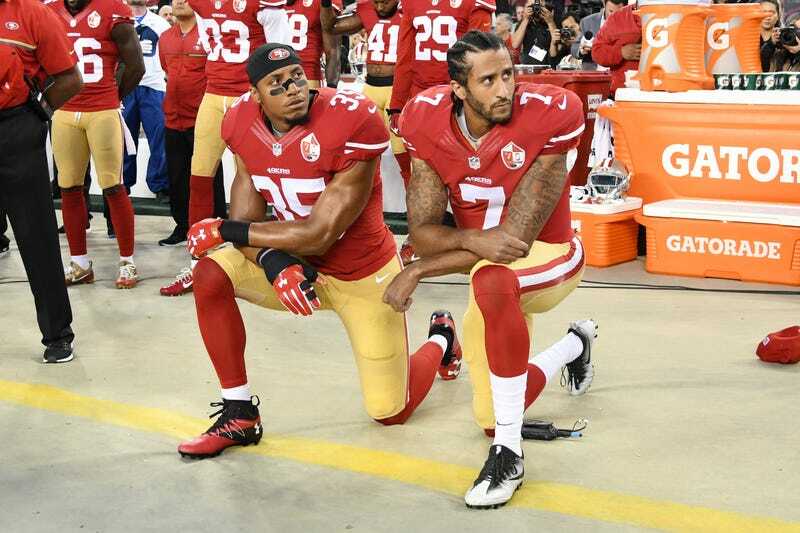 The Journal reports that the money Kaepernick and Reid received to settle their grievances against the league—grievances in which they alleged among other things that the league blackballed them and prevented them from playing after they began kneeling on the field during the national anthem as a form of silent protest—is far less than what they would have gotten had they prevailed in their case against the league. When all is said and done, it is unknown how the less than $10 million will be divided between Kaep and Reid and how much each will net after they are done paying attorney and legal fees. Neither the NFL nor the attorney representing both players gave comment to the Journal on the reported settlement. There is a confidentiality agreement in place to keep both sides from discussing the deal that was reached last month. The Journal notes that had Kaep prevailed in his grievance, the collective bargaining unit the league has with the players would have provided for him to receive damages worth up to three times what it was determined he lost as a result of being prevented to play, and for a player of Kaep’s caliber, that number could have gone as high as $90 million, or three times the $30 million he is worth. On the other side of that, if both sides had not agreed to settle, the league could have been on the hook for a costly litigation should Kaep have decided to take the case the court. Kaepernick filed his grievance in 2017, accusing the league and all 32 teams of keeping him from playing because of the protests. Reid filed his grievance in 2018 and was later signed by the Carolina Panthers midway through the 2018 season. Colin Kaepernick Will Finally Get His Seat at the Table When the NFL Meets Players Next Week—but Will He Take It?